This painting was done during February 2016 and shows a scene on the out skirts of West Southampton. 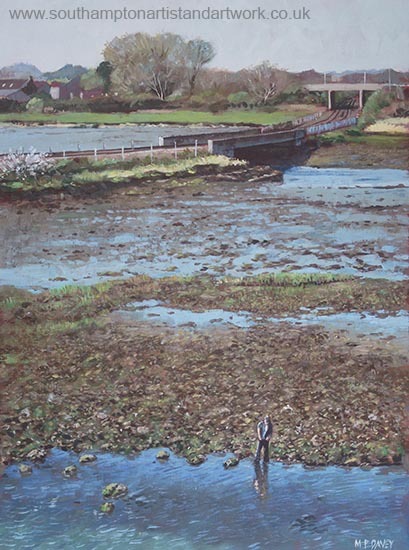 The river is the Test and in this view depicting the Totton area, we see that the painting is dominated by a bridge carrying the main Southampton to Bournemouth railway line, the track on the right hand side heading for the resort. Further in to the distance the A35 Totton Bypass road bridge goes over the tracks. On the left hand side can be seen the start of Totton town. In the foreground, walking around the mud flats with the tide out at this time, can be seen a man possibly looking for a place to fish. The painting is sized at 16" x 12" and painted on thick stretched paper.